Combine water and salt in a large non-stick saucepan. Bring to boil over high heat. Reduce heat to medium and slowly whisk in cornmeal. Once all of the cornmeal has been added, reduce heat to low, continue to cook and whisk continuously for 10 minutes. Remove from heat and stir in butter, cream, parmesan cheese and herbs. Season to taste with salt and pepper. Pour polenta into a 9x13 pan and refrigerate overnight. Cut polenta into 48 squares, about 1 ½” x 1 ½” each. Coat the bottom of a large sauté pan set over medium-high heat with a thin layer of olive oil. Add the polenta squares to the hot oil and cook until golden brown on both sides. Drain on paper towel and place on serving platter. 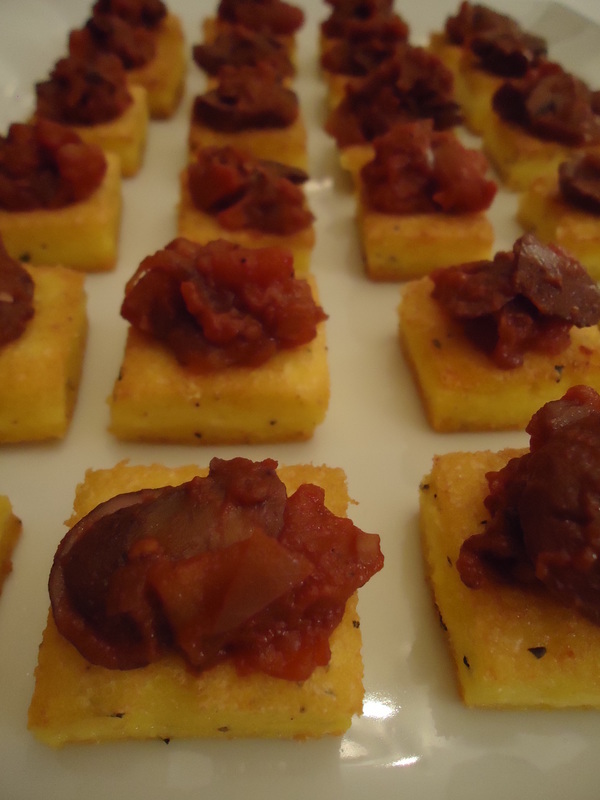 Top each polenta square with a small amount of mushroom ragu and garnish with fresh basil.